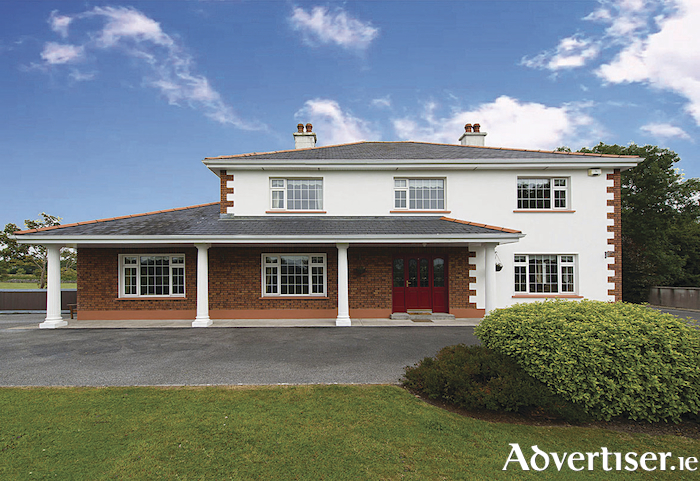 Joint agents DNG Maxwell Heaslip & Leonard and DNG John Joyce have just launched to the market this impressive five bedroom family residence, comprising c3,340sq ft of spacious living area and set on a beautifully landscaped site of c0.7 acre. Located just south of the N63 at Ballyglunin Junction (Finns Cross ) and approximately 4km from the town of Abbeyknockmoy, it has the additional benefit of being within a five minute drive of the M17, allowing access to Dublin, Limerick, and Sligo by motorway, as well as Galway city which is only 25km away. Presented in immaculate condition, this impressive owner-occupied home extends to approximately 3,340sq ft of living space and offers the perfect opportunity for a growing family to put down roots. Ground floor accommodation comprises an impressive entrance hall with feature oak staircase, two spacious family living rooms, a dining room, spacious kitchen, a utility with downstairs bathroom, and a spacious playroom/study/office. Further accommodation to the first floor comprises five double bedrooms, two of which host en suite bathrooms, and a main bathroom, complete with Jacuzzi bath. The property has the benefit of many extra features to include hollowcore floors, heat and smoke alarm system, intruder alarm system, water softening system, security side gates, double glazed windows throughout, and ofch with separate control of upstairs and downstairs heating systems. Externally, the property boasts beautifully landscaped gardens with tarmac driveway, a large detached garage with electric roller door and side door, which would make an ideal standalone office/granny flat and its own private back-up well. Joint selling agent James Heaslip MIPAV MMCEPI expects keen interest in this impressive property. “This is an outstanding detached family home in a wonderful countryside location," he said. "The property comes with the added benefit of many extra features, such as extensive tiling and wooden flooring, spacious living areas, feature oak staircase, many security and safety features, a solid fuel stove with feature brick surround, and beautifully landscaped gardens with large detached garage, to mention a few." Guiding at €350,000, viewings of Marian House, Ballyglunin, may be arranged by contacting joint agents DNG Maxwell Heaslip & Leonard on 091 565261 or DNG John Joyce on 093 25078.